What can Japan do about its reactor? Shirakawa, Japan (CNN) -- Japanese authorities are operating on the presumption that possible meltdowns are under way at two nuclear reactors, a government official said Sunday, adding that there have been no indications yet of hazardous emissions of radioactive material into the atmosphere. The attempts to avert a possible nuclear crisis, centered around the Fukushima Daiichi facility in northeast Japan, came as rescuers frantically scrambled to find survivors following the country's strongest-ever earthquake and a devastating tsunami that, minutes later, brought crushing walls of water that wiped out nearly everything in their paths. Chief Cabinet Secretary Yukio Edano told reporters there is a "possibility" of a meltdown at the plant's No. 1 reactor, adding, "It is inside the reactor. We can't see." He then added that authorities are also "assuming the possibility of a meltdown" at the facility's No. 3 reactor. The efforts to control the temperature of atomic material, by pumping in sea water and boron, are taking place at the same facility where four were hurt late Saturday in an explosion. Edano said only a "minor level" of radiation has been released into the environment -- saying it all came from a controlled release of radioactive steam, insisting there have been no leaks. "We do not believe it is harmful to human health," he said. About 180,000 people are being evacuated from within 10 to 20 kilometers (6 to 12 miles) of the Daiichi plant -- which is in addition to the thousands that have already been taken away who live closer by. More than 30,000 more people were being evacuated from their homes within 10 kilometers of the Fukushima Daiini nuclear facility located in the same prefecture. The news of the possible meltdowns came as rescue efforts resumed Sunday morning in areas devastated by the 8.9-magnitude quake and subsequent tsunami, which unleashed a wall of seawater that decimated entire neighborhoods. Rescuers dug through mud and rubble to find the buried, both alive and dead. Japan's Prime Minister Naoto Kan said more than 3,000 people have been rescued, according to the nation's Kyodo News Agency, some of them plucked from collapsed homes, muddy water and burning debris. While the official death toll from Japan's National Police Agency was at 763, with 639 missing and 1,419 people injured. The actual toll is thought to be much higher, with Japanese public broadcaster NHK reporting more than 900 dead and Kyodo News Agency saying the death toll could top 1,800. The number is expected to rise as rescuers reach more hard-hit areas. In one coastal town alone -- Minamisanriku, in Myagi Prefecture -- some 9,500 people, half the town's population, were unaccounted for, Kyodo reported. With most stores and gas stations closed, a main task for many in the hardest-hit areas Sunday morning was getting by -- and, in some cases, getting out. Scores lined up at the few gas stations, drug stores and grocery stores that had opened, with the shelves largely empty amid the rush to get food and the difficulty in restocking it. They also braved an seemingly endless barrage of aftershocks. The U.S. Geological Survey reported more than 140 such quakes -- magnitude 4.5 and higher, including a 6.2-magnitude quake just before 10:30 a.m. Sunday -- in, near or off of the east coast of the Japanese island. 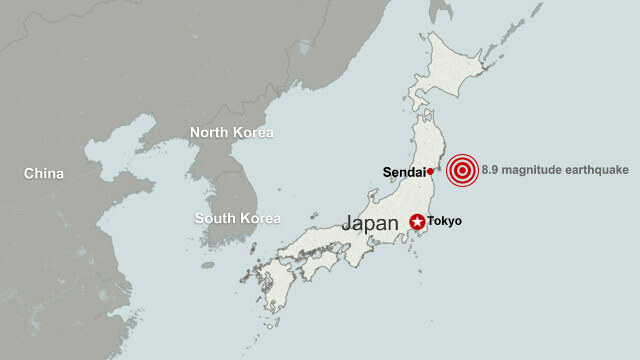 Friday's quake was centered about 130 kilometers (80 miles) from Sendai. The city, with a population of about a million, is located in a farming region already battling youth population losses to big cities, leaving aging residents struggling to keep up with the global economy. While there was little visible damage in that city, the devastation -- most of it caused by the tsunami, which reached several miles inland -- was readily apparent in coastal areas. 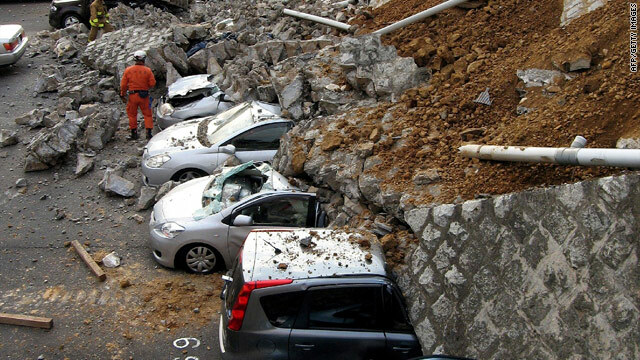 In the city of Shirakawa, south of Sendai, rescuers dug through rubble with shovels to try to reach 13 neighbors trapped when the earth opened up and swallowed their homes. Relatives and friends stood in the cold, with temperatures near freezing overnight, quietly watching, praying and waiting. Others wept. In other affected areas, military choppers plucked people from rooftops. In some cases, rescuers trudged in muddy water, carrying survivors on their backs. Weary, mud-spattered residents wandered through streets filled with crumpled cars and other debris. Meanwhile, millions more around Japan were dealing with other repurcussions of Friday's quake. The quake disrupted rail service and affected air travel. Flight cancellations left at least 23,000 people stranded in two Tokyo airports, Kyodo said. Departing and arriving flights resumed Saturday. Limited rail service also was back in operation Saturday. Tokyo's Disneyland and Tokyo Disney Sea will close for 10 days, Kyodo News Agency reported, one of a host of closings, cancellations and other disruptions in the quake's aftermath. About 2.5 million households -- just over 4% of the total in Japan -- were without electricity Sunday, according to Fujisaki, the nation's U.S. ambassador. This marks a steep drop from the previous number, when 6 million households had no power. A desire to conserve power prompted decisions to turn off lights Saturday at a host of landmarks all around Japan -- some of them hundreds of miles from the main quake's epicenter, like the Tsutenkaku Tower in Osaka, Tokyo Tower and Rainbow Bridge in Tokyo, and Bay Bridge in Yokohama, the Kyodo News Agency reported. 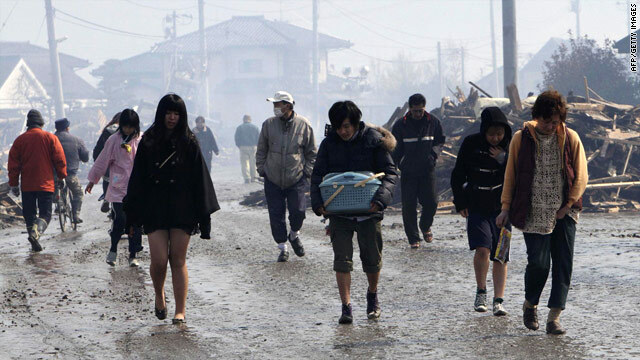 Japan plans to dispatch 100,000 members of its Self-Defense Forces to the quake-ravaged region -- double the previous number -- Defense Minister Toshimi Kitazawa said Sunday, according to the Kyodo News Agency. Japan's government also has made a formal request for U.S.aid, including military support, and full planning for deployment is in effect, with the U.S. military in Japan taking the lead, according to Sgt. Maj. Stephen Valley with U.S. Forces Japan. The nuclear-powered aircraft carrier USS Ronald Reagan, along with a guided-missile cruiser and destroyer ship, arrived off Japan's coast Sunday morning to support Japanese forces in disaster relief operations, the U.S. Department of Defense said in a statement. The U.S. Agency for International Development has sent two search and rescue teams, from Virginia and California. Those teams, of about 150 people and 12 rescue dogs trained to find survivors, were expected to arrive Sunday morning and immediately begin working alongside Japanese and international teams. At least 48 other countries and the European Union also have offered relief to Japan, and supplies and personnel are already on the way. The quake was the latest in a series around Japan last week. Friday's quake is the strongest earthquake in recorded history to hit Japan, according to U.S. Geologic Survey records that date to 1900. CNN's Tom Watkins, Anna Coren, Kyung Lah, Paula Hancocks, Brian Walker, Kevin Voigt and Sean Morris contributed to this report.